Guest post by Kellen Walker, thesis-year Interdisciplinary Arts & Media student. Fast forward a half blip of New Yorker time and I’m headed to rehearse with The Sin Eaters at the Abrons Art Center. I meet up with my fellow Eaters, Mike & Moe. Mike St. John is an alumnus of the media interdisciplinary MFA; Moe is his best friend surviving in Brooklyn. For any who aren’t familiar with sin eating, the term originates from the middle ages when a beggar was paid to eat a crust of bread over a recently deceased body. This labor was a Catholic ritual that aimed to absolve the person’s sins. We, The Sin Eaters of contemporary time, tweak this ritual with the additive of competitive eating. 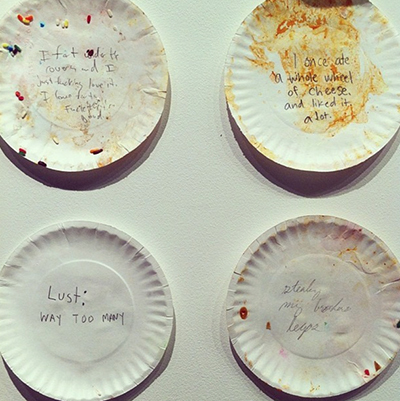 We have created an interactive performance series that depends on audience members confessing a sin written on a paper plate. We then put food atop the plate and eventually competitively eat all the sins. 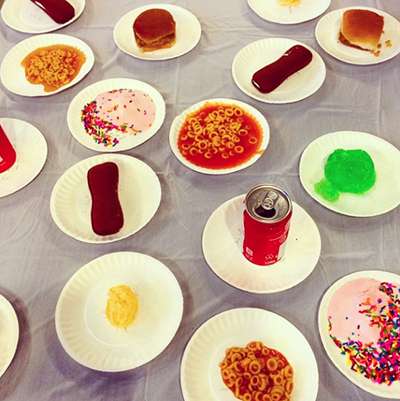 For New York, the food symbolized our idea of the seven deadly American sins– Spaghetti-Os, Jello, Cheese Whiz, Coca Cola, Devil Dogs cakes, Ice Cream and White Castle sliders. The show was wild. This time around, we barked to the crowd a $100 prize to the winner who ate the most. This brought an actual professional competitive eater, Mike “The Real Skinny” Hoffman, to show and compete. About a dozen others joined us at the table, either to get in on the fun, go for the money, or lighten our load. The concept was simple: competitively eat the foods on this table, one at a time, and when you’re done with a plate, keep it and move on to the next. The person who ends up with the most plates wins. I can’t say that I remember much of the eating spectacle. I went for the Cheez Whiz first. A terrible idea. Eaters like Mike and Moe and Moe’s girl, Laine, were wise to grab the plates of melted ice cream, bending the plates to pour the liquid in an open mouth like cement. As soon as I look over, I see Mike’s stack of plates tripled to mine. The triangle sounded the end, and Mike was crowned the winner. What everyone but us Sin Eaters didn’t expect was the planned ritual of going around the circle to read each sin out loud. Most confessions made us laugh. Some, poignant. As always, there were three or four that were heartbreaking jutted next to the lighthearted yucks. After the show, we spoke with some audience. My friend told me she lied in her first confession just because she couldn’t think of one on the spot. And I had to laugh– I recall the first time I confessed sins to a priest (in grade school, mind you), in which I lied just to make it sound like I had something good to get off my chest. Moe’s favorite was something like: I slowly drink my roommate’s almond milk, day by day. I can’t stop thinking about the woman in the wheelchair that Mike had to assist with writing the sin on a plate. Her confession: I am envious of people who walk. That, next to: Wrath– I urinated in my land lady’s pool. There’s such richness in the contrast. I’m enamored by this act of letting go of something you’ve emotionally stuffed down. Call it my Catholic upbringing, but I am a sucker for the act of reconciliation. Post-confession, you’ve now put whatever ails you out in the open. Let the community of Sin Eaters now digest for you. 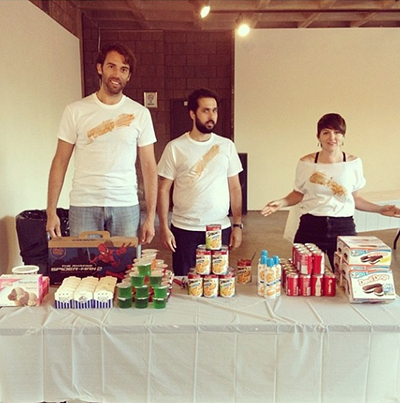 The Sin Eaters is a performance group that explores the culture of competitive eating.